For those of you looking for a great dessert wine, light, racy and friendly yet harmonious and elegant rather than too syrupy and ultra sweet, you should try to discover the wines from the Coteaux du Layon, a low key wine region of the Loire valley. Belonging to Gerard Depardieu (yes, the famous French actor), who acquired it 1989, Chateau de Tigné is a beautiful medieval estate dating back from more than 10 centuries. The magnificent Chateau resides in the middle of Tigné, a small village located in the heart of the Coteaux du Layon appellation, south of Angers and west of Saumur. The Coteaux du Layon gets its name from the Layon River, which cross the village of Tigne. Chateau de Tigne produces great dry and sweet whites from Chenin Blanc; solid, earthy and juicy reds and roses from Gamay and Cabernet Franc. Coteaux du Layon is a dessert wine made exclusively with the versatile Chenin Blanc grape variety, also locally called "Pineau Blanc de la Loire", which produces some of the most interesting whites in the world like Savennieres (excellent dry whites mainly still), Vouvray (dry, off dry, sweet and sparkling whites), and of course Coteaux du Layon, as well as Bonnezeaux and Quarts de Chaume. Many other white still and sparkling wines produced with this grape can be found in the Loire Valley from more generic appellations. Coteaux du Layon is the widest wine area of the Anjou region. Along the banks of the Layon river, the vines are protected by gentle rolling hills. Although good semi-dry white wines are produced, Coteaux du Layon has been recognized for its sweet white wine for at least 15 centuries ! The most reputed of all is the sweet wine coming from Chaume. Like in Sauternes, the grapes are left on the vines until over-ripeness and apparition of Botrytis Cinerea, to obtain maximum concentration of the flavors and sweetness. It means that the careful and selective harvest take place in Coteaux du Layon later than any other places in the Loire valley. The resulting wines are rich, complex and balanced with great ageing potential. The Anjou region encompasses sweet whites from the regional appellations like Coteaux du Layon and Coteaux de L'Aubance, but also has two more specific appellations (small enclaves of the Coteaux du Layon appellation) that are considered like Cru producing the most distinctive and expressive sweet whites of the area: Bonnezeaux and Quarts de Chaume. These last two Cru(s) are mainly produced in the best vintages and usually only as a result of the Noble Rot (or Botrytis Cinerea), sweet white wines from botrytized Chenin Blanc grapes. The wines have impressive longevity and are produced in very small quantities. 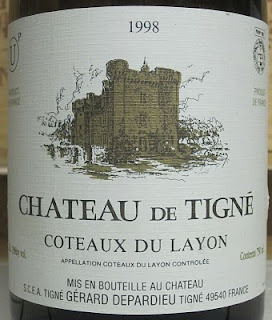 The sweet and balanced 1998 Château de Tigné Coteaux du Layon is beautifully layered with orange peel, apricot and ripe peach flavors enhanced by a great acidity that temperate the sweetness and brings lovely freshness. It is a great dessert wine not overly sweet with delineated acidity and racy attitude to enjoy over an apple tart, a fruit salad, poached pear or peach. By the way, and do not worry it doesn’t impart the taste, this wine is also kosher and good for Passover.